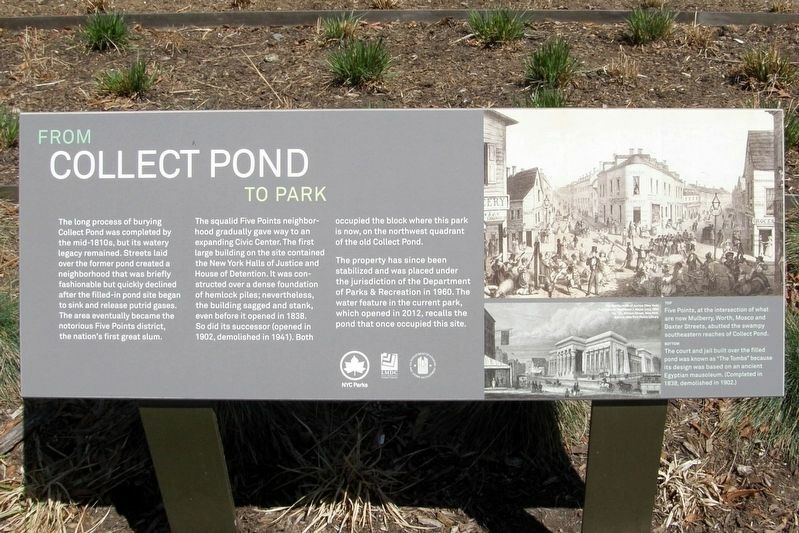 The long process of burying Collect Pond was completed by the mid-1810s, but its watery legacy remained. Streets laid over the former pond created a neighborhood that was briefly fashionable but quickly declined after the filled-in pond began to sink and release putrid gases. 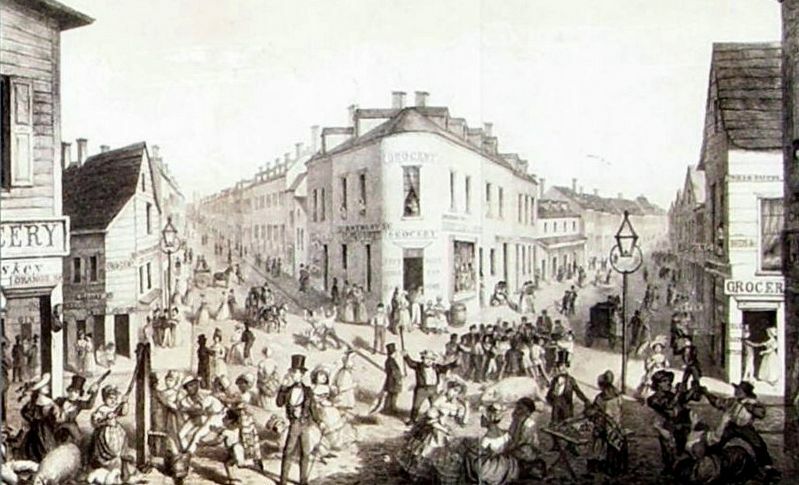 The area eventually became the notorious Five Points district, the nation’s first great slum. The squalid Five Points neighborhood gradually gave way to an expanding Civic Center. 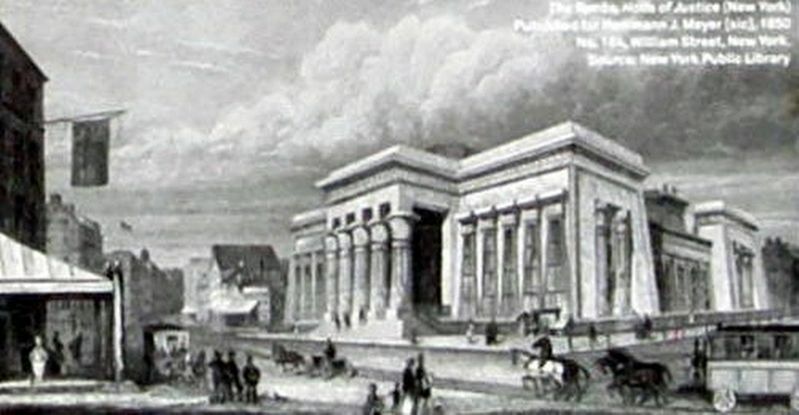 The first large building on the site contained the New York Halls of Justice and House of Detention. It was constructed over a dense foundation of hemlock piles; nevertheless, the building sagged and stank, even before it opened in 1838. So did its successor (opened in 1902, demolished in 1941). Both occupied the block where this park is now, on the northwest quadrant of the old Collect Pond. The property has since been stabilized and was placed under the jurisdiction of the Department of Parks and Recreation in 1960. The water feature of the current park, which opened in 2012, recalls the pond that one occupied this site. Location. 40° 42.977′ N, 74° 0.12′ W. Marker is in New York, New York, in New York County. Marker is on Lafayette Street near Leonard Street, on the right when traveling south. Touch for map. Marker is in this post office area: New York NY 10013, United States of America. Touch for directions. Other nearby markers. At least 8 other markers are within walking distance of this marker. The Legendary Collect Pond (here, next to this marker); Death of the Collect Pond (here, next to this marker); Collect Pond and the City (here, next to this marker); Collect Pond Before The City (here, next to this marker); “The Tombs” – A Mausoleum for the Living (was within shouting distance of this marker but has been reported missing. ); Collect Pond Park (was within shouting distance of this marker but has been reported missing. ); Abraham De Peyster Statue (about 400 feet away, measured in a direct line); Engine Company 31 (about 500 feet away). Touch for a list and map of all markers in New York. Five Points, at the intersection of what is now Mulberry, Worth, Mosco, and Baxter Streets, abutted the swampy southeastern reaches of Collect Pond. More. Search the internet for From Collect Pond To Park. Credits. This page was last revised on April 8, 2019. This page originally submitted on April 6, 2019, by Larry Gertner of New York, New York. This page has been viewed 45 times since then. Photos: 1, 2, 3, 4. submitted on April 6, 2019, by Larry Gertner of New York, New York. • Bill Pfingsten was the editor who published this page.